Best known for playing Kenneth Parcell on NBC sitcom 30 Rock, and for being a regular face on the Late Night with Conan O’Brien, Jack McBrayer is one well decorated American film/voice actor and comedian who needs little or no introductions at all, as you can see his works and performances already does that. Mcbrayer was born in Macon, Georgia on May 27, 1973, where he lived with his family till age 15 when they all moved to Conyers. He has a degree in theatre administration from the University of Evansville, Indiana. After graduating from college, he worked at The Se Mcbrayer Mcbrayercond City and IO Theater, Chicago, for seven years (1995-2002). It was during his time at the theatre that he met Tina Fey who would later offer him a role on the NBC sitcom 30 Rock. His role as Kenneth Parcell on the sitcom has earned him three Primetime Emmy Award nominations, twice for the Outstanding Special Class category and once for Outstanding Supporting Actor in a Comedy Series. He has also won the Screen Actors Guild Awards for Outstanding Performance by an Ensemble in a Comedy Series for the same role. Between 2002 and 2004, Jack McBrayer appeared in not less than 80 sketches on Late Night with Conan O’Brien, often making a caricature of his Southern upbringing by portraying stereotypical hillbilly characters. In 2007 and sometime in 2008, he appeared on the show playing Kenneth Parcell, his character from 30 Rock. He would later join O’Brien’s Legally Prohibited From Being Funny on Television Tour team making stops at Universal City, California, Atlanta, and Eugene, Oregon. In 2008, he appeared on Mariah Carey’s “Touch My Body” music video and in the first episode of Tim and Eric Awesome Show Season V as a spokesman in a spoof advertisement. Jack also appeared on the animated series Ugly Americans as a voice actor, and on the second season of Phineas and Ferb, as Irving. In 2012, Jack Mcbrayer again lent his voice to the Disney animated film Wreck-It Ralph, its 2018 sequel and in other animated movies and shows like Cats & Dogs: The Revenge of Kitty Galore, Yo Gabba Gabba!, Wander Over Yonder, Puppy Dog Pals and Phineas and Ferb. He was also one of the actors who voiced the 2018 audiobook A Day in the Life of Marlon Bundo. The Rock 30 star has also appeared in some commercials like the Kia commercial he did alongside Los Angeles Clippers player Blake Griffin and the one he did for Barnes & Noble in 2013. He also made a cameo appearance on the season 10 premiere episode of The Big Bang Theory, playing Randall (Penny’s older brother). Also Read About: Jim Parsons Net Worth, Married, Husband, Wife Or Boyfriend, Is He Gay? The U.S comedian and actor is currently worth $6 million. His earnings are from his career as an actor, comedian and voice artist. Jack Mcbrayer reportedly bought a grand mansion in L.A in 2011. The 2,594 square feet home with 3 bedrooms and 3 bathrooms cost him $1,975,000, after two years of living in the house, he sold it off for $2 million. 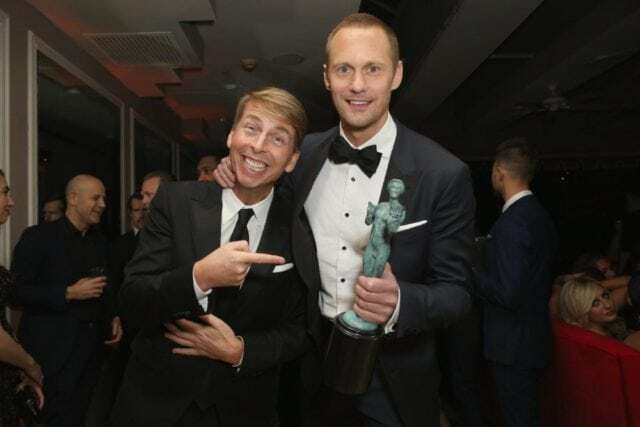 Is Jack Mcbrayer Gay, If Married Who Is His Wife Or Partner? Now to the big question, is Jack Mcbrayer gay, is he married? If he is married who is his wife or partner? Each time this question is asked it leaves many confused about what response to actually give, this is because the famous actor/comedian has successfully kept this area of his life away from the public and the media for many years. He has never been seen with any man or woman and has not been linked with any rumor of dating anyone, he has not been spotted with any wife/partner or children and the worse of it all is that his sexual orientation is not known. So this aspect of Jack’s life has remained a mystery to all and sundry. We just have to wait till he makes the big revelation, that is if there really is any revelation. Jack stands at a height of 5″10, that is 1.79 meters and weighs 73kg. His other body stats are not known. He has dark brown hair and brown eyes. Education: Heritage High School, University of Evansville, Indiana.